Having an official Social Selling program within your organisation is one thing. Maybe you made the crucial business decision to change to a social culture; to align your sales and marketing functions; to throw out the sales funnel manual. All good stuff… providing you’re still getting the buy-in a little way down the line. Old habits are hard to break and, for many large organisations, sales and marketing can be among the most entrenched of all departments. So, is your business Social Selling? Or are you spending more time selling social? If you find you’re ‘selling social’ to convince everyone of the value of the new way of working and not getting the traction you need when it comes to Social Selling, then listen in. We’ve got some thoughts on how to reinvigorate your program and nail the culture change once and for all. It’s one thing launching your shiny new Social Selling program. Maybe you gave everyone their 20-minute daily routine (a bit like the Tribal Impact Coffee Cup Routine) to get them into some great new working habits. Perhaps there are some excellent areas of best practice where people have buddied up and are supporting each other to make the necessary culture change. There comes a point however, where, for true success, you need to see the program take on a life of its own. It should become instinct for people to operate differently. Sales and Marketing’s weekly meetings ought to be combined to encourage a shared, integrated approach. So, why hasn’t this happened? What have you missed? All the statistics point to the fact that Digital Selling gets better results. But, after all, they are just statistics. You need to ensure you understand, and communicate, the ‘what’s in it for me’ message to your organisation to ensure people know it’s worth their while making the jump to a new way of working. The benefits of Social Selling are just as applicable to the individual as they are the corporate entity. 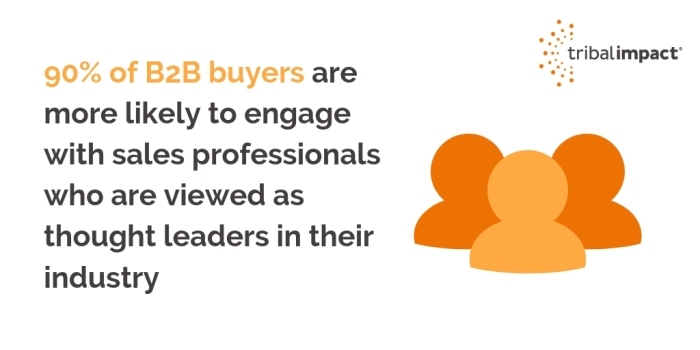 90% of B2B buyers are more likely to engage with sales professionals who are viewed as thought leaders in their industry. By engaging with the Social Selling program your employees have the chance to become just this: an expert in their field; someone whose opinion is valued, even sought. They will reap the rewards in terms of meeting their sales targets but they may well also accelerate their career by increasing their value in the market. In some ways, this ties in with the point made above: people need to understand the personal benefits of Social Selling as much as the corporate ones. However, a successful program needs to add a layer of incentivisation to encourage engagement and good levels of activity. Use your social champions: those who are totally bought in to the program can help to share their personal successes and give people who are less enthusiastic some ideas to put into place. Rewards don’t have to be financial. As far as possible tie them to the program so that the success is reinvested. Maybe you could offer your true champions of change the chance to get some advanced training; for example, they might want to improve their blogging skills or understand more about SEO. They benefit personally from this but so does the program as their new knowledge comes in to play with better content. You need to have a clear view of everything otherwise you can’t celebrate your successes. Measurement – and demonstrating your return on investment – is key to keeping all parties bought in to the idea of Social Selling. It’s well known that deal sizes are bigger and close faster for social businesses. We achieved our target sales pipeline from social selling in half the time forecast. Already, 13% of this pipeline has converted into sales, far quicker than our typical 2-4 year sales lead times. For individuals, LinkedIn calculates an SSI score – Social Selling index – which they can use to see whether their efforts are well targeted. It’s not an exact science but it gives an indicator. Successful programs engage all departments so make sure your employee communications team are involved and can help to showcase some of the more impressive results – both personal and corporate. A raised profile is never a bad thing for an individual, especially if they’re keen on advancing their career. We’re owning this…or are we? You need to think of your Social Selling program as a kind of corporate pet. It needs nurturing. You won’t get far if you let it off the lead to fend for itself. It likes lots of good, rich content to snack on; it needs a pat on the head every now and again too. And we’d definitely recommend revisiting the agility classes if you haven’t been for a while, apparently it is possible to teach an old dog new tricks! In all seriousness, operating a corporate Social Selling program is demanding. Someone should be looking after the flow of content, celebrating successes, sharing best practice case studies and encouraging and incentivising people to do more and more. They should be retraining people to drive out bad habits, auditing the quality of content and assessing the data that comes from the metrics to ensure that the program is having the desired effect with the target audience. So, who does your program sit with? Who owns it? Success can be measured in many different ways and it’s important for each department to have their own KPIs as well as there being clear success criteria for the program as a whole. In addition, success measures should be varied. Often, though, if it’s not a monetary metric, it isn’t a priority. Try looking at the less tangible signs of success, such as employee morale, the level of trust in your target audience or your customer satisfaction scores. All these factors should be enhanced by having a true Digital Selling culture and they all lead to more and greater sales, albeit indirectly. 5. Is There A Lack Of Alignment Around Content? The older and wiser Digital Selling becomes, the more obvious it is that content is the real key to success. Algorithms are also getting smarter, with many serving only content that is relevant and required to your audience. So, the social side of business; listening and understanding the problems being experienced by your target audience, curating and creating content to serve them and delight them is now more important than ever. To be this effective, there simply has to be a content strategy. The whole organisation needs to be working to the same storyboard, aligning with the same messages. With this in mind, it’s also clear that content doesn’t belong in the lap of any one department any more. There needs to be a variety covering, for example, product content, customer experience content, thought leadership content (and by this we mean expertise that is relevant industry-wide, not just in relation to your own products and services), third party content in terms of links to other useful sources of information, and lastly, agile content. By this, we mean content that can be used as a core topic and adapted to reach out to specific customers. This is where the real value add comes in: we can nurture our audience and our customer accounts by having advice or solutions that are specifically to address the problem they have. Right now. That’s powerful stuff. 6. How Is The Content Being Produced? Who Are Your Curators, Your Creators And Your Planners/Strategists? A by-product of launching your Social Selling program will be the ability to identify those with a gift for content. You might have some excellent curators who source interesting and relevant articles, add their own, equally relevant, opinion and share them with your audience. Additionally, you will discover who can write really well – and therefore generate original, worthy content which can be shared, multi-purposed and commented on again by those curators. The core content though, needs to be plentiful to provide inspiration and material to all those wanting to be active within the program. Whichever advocacy tool you’ve chosen will allow you to tag and categorise all the content so people can find something to illustrate whichever point it is they want to make. If this process isn’t simple, people won’t post. It’s as straightforward as that because they have a day job. They are busy with targets and deadlines that, in their mind, take a higher priority than social media posts. Once the content machine is flowing free of glitches, they will soon realise that posting is, in itself, a means to an end when it comes to meeting targets and building their sales network. 7. Have You Successfully Integrated Employee Advocacy, Social Selling And Influencer Marketing? This approach forms the basis of our co-authored report with Onalytica – Employee Advocacy 2.0. It takes Social Selling as we know it and moves it forward into a different league by combining it with employee advocacy and influencer marketing. The organisation is therefore only carrying out one complete process as opposed to several new tactics. This means there is one content strategy, one clear owner/project manager for the program, and everyone is considered as being on the same program, with the same holistic training schedule overlaid to ensure progress from social zero to social hero. Taking this joined up approach, which is a fairly subtle shift in mindset, will ensure huge gains can be made in terms of culture change and mindset within the business. To quote Steve Jobs, “You cannot mandate productivity, you must provide the tools to let people become their best.” Your Social Selling program tool will only be as good as the effort you put into keeping it active and current. When they first launch a Social Selling program, many businesses make the mistake of investing only in the tool – they forget that, without the associated policies, training and incentivisation, there’s no real program to speak of. But, as programs mature, they can start to look less successful. The novelty wears off, people forget who’s in charge of content and the tool can become redundant. 8. Are Your LinkedIn Sales Navigator Licences Being Used? Seen as the holy grail for social sellers, LinkedIn Sales Navigator is indeed a powerful tool. But, like anything, it’s only as good as the skills of the person using it. It’s all too easy for businesses to invest in lots of licenses and then expect their social sales to fly. What about the training and best practice education? Or a strategy to ensure the business is working together to achieve one goal? There are two keys to success with Sales Navigator: the first is ensuring people understand the art of the possible; and the second is to create a habit in people’s daily routine to make sure they get used to using the tool regularly. Once they see its true benefit, they won’t look back. We promise. LinkedIn Sales Navigator is a great tool for achieving the above actions. Research and searches are unlimited but InMails – the things that potentially carry the power to grow your network – are limited so it’s crucial to get the right training for your people before you set them off on a mission they can’t complete. Check out our blogs; '3 Ways To Get The Most Out Of Your Sales Navigator Investment' and 'Is LinkedIn Sales Navigator Worth The Money?' for more info. 9. Is Your Advocacy Tool Full Of Content (and that means quality, shareable content)? Ok, so we’ve mentioned this a couple of times so far. Content is key – we stand by that. However, it does need to be the right sort of content, of course. Ultimately, you are trying to engage your people in visiting a tool, picking up on something interesting and then sharing it with their network. If the content is boring or irrelevant, who in their right mind wants to throw it into social media land with their name associated with it? One really important thing to remember with content is to allow variety. Being relevant doesn’t mean everything has to be one-dimensional. Remember, all your departments need to be able to use this content and some will build relationships differently – and will be at different stages – to others. Social Selling is very much about a long game. Relationships need to be nurtured; results are never seen overnight. Your content needs to reflect this so it’s worth having some general topics in the mix which allow some quick wins when it comes to adding value. For example, do some keyword research on what your audience is searching for and use this to inform some different avenues for your content. Providing you have clear policies and guidelines on what constitutes appropriate content, you can afford to keep things fresh and varied. 10. Are You Targeting The Right Audiences Through Your Social Media Platforms? Have You Continued To Evolve Your Customer Avatars? Creating customer avatars is a powerful way of getting under the skin of your audiences. But, all too often, businesses will undertake an exercise like this when they full together their 5-year plan and then never revisit it. People’s consumer habits are continually changing – hence you are still reading this detailed blog post – and you cannot afford to have a Social Selling program that’s got an out of date audience avatar. 11. Are There Any New Tools That Could Solve A Process Issue Or Serve You Better Than Your Existing Choices? There are many tools Social Selling tools and more are always coming to market. As with any investment, it’s important to track its value. It’s fairly logical to assume that, after a qualifying period, you might have discovered some nuances you weren’t aware of before and these may well have influenced your choice of tool. Any Social Selling program has to be evolutionary to survive – just look at the nature of what we are doing here. We’re responding, as brands, to the new found power of the people when it comes to researching and making buying decisions. Gone are the days when promotional messages could be sneaked into a campaign – nowadays, this is the quickest way to lose the trust of your prospective buyers. Check out our recommendations for tools during 2018 and beyond in our blog. 12. What Incentive Do You Give Your People To Use The Tools In The Program? We’ve covered the need for incentives before, and the fact that they don’t need to be financial. Indeed, many of your people will be excited at the thought of improving their status on social media. It has become a much more accepted way of working and people no longer necessarily see a wall between their personal or leisure use of social media and their business activity – particularly since LinkedIn began to emerge as a very business-focused platform just as Facebook changed its algorithms in favour of personal relationships and friendships. With any Social Selling program, it’s important to outline the benefits to the individuals involved and not just focus on the clear corporate benefits. Additionally, once the novelty of being in the program has waned, it’s a good time to reinforce these personal benefits, perhaps by using real examples as case studies. Get your social heroes to speak about the benefits they’ve seen personally. Perhaps they can explain that these benefits take an investment of time to manifest. Finally, if people are really disillusioned with the program and are claiming not be experiencing any benefits, it’s worth revisiting a couple of things: get them to brainstorm what they want from their involvement in the program and find out whether these expectations can be met – either by the program as it stands or through some slight tweaking. Additionally, audit their activity to date and the approach they are using and make sure they’re using best practice. It might be that some additional training is needed to help them get the best from the tools and the program. 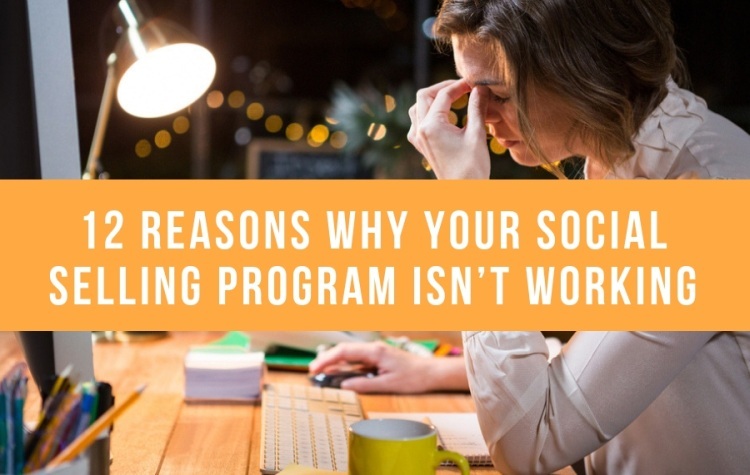 So, there you have it – 12 reasons why your Social Selling program might not be working. Underlying most of our advice is training. When a large organisation implements a major new way of working, such as Social Selling, it’s inevitable that it will take time to embed. People need to understand what’s expected of them and those who own the program need to see how best the concept fits with their business. By continually learning lessons and feeding your knowledge back into the training loop, you’ll benefit at every stage from relevant and up-to-date advice for everyone involved.